Milwaukee Arts Funding: A Debate Between Davids and Goliaths? In the Milwaukee arts world, Goliath venues are finding new support while the Davids of the arts scene are facing severe funding loss. Two studies in Milwaukee are looking at public support for the arts from very different angles. One, as reported in an opinion piece in the Milwaukee Business Journal, is to be conducted by a nonpartisan research firm and has been commissioned by the local tourism bureau (Spirit of Milwaukee). 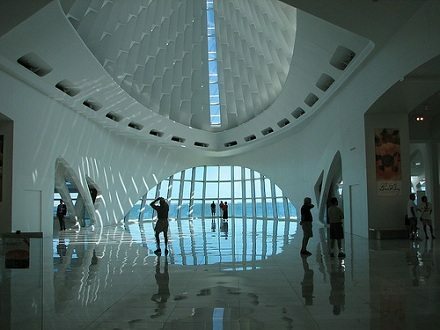 According to the editorial, major arts venues located on county-owned facilities, including the Milwaukee Art Museum, the Public Museum, and Discovery World (a science museum), are about to launch a coordinated group capital campaign that some expect to include a target of more than $50 million. The study will look into a variety of alternate funding options including the potential of creating a dedicated arts sales tax—this at a time when “tax” has become a four-letter word. The Business Journal opinion piece suggests that these major arts venues need support but that there is not enough in charitable contributions to go around, concluding that the study will be a good way to start exploring how these major arts venues can get what they need. At the other end of the spectrum, a report that has just been released by the Nonprofit Management Fund and Management Cornerstones has identified many very significant challenges for small nonprofit performing arts organizations (such as the African-American Children’s Theatre, one of the few remaining theatre companies for people of color of any age that remain in Milwaukee, and Early Music Now, an organization bringing early Renaissance music and traditional instruments to venues around the city). On the whole, there is support for the arts in Milwaukee, much of it through the United Performing Arts Fund (UPAF). But UPAF supports only a limited number of very well established performing arts groups, not the small, more experimental organizations, and the report notes that some community leaders feel that “there should be fewer small arts organizations.” In addition, the report found that some organizations perceive a racial bias in support for the arts, while some civic leaders have said that “nonprofit arts organizations need an entirely different business model,” although specifics on such a new model were few.